In Parts 1 and 2 of this series on how to write Chinese characters, we talked about the basic strokes that make up each Chinese character and also some basic principles behind the order in which you write the strokes in Chinese characters. These basic components and rules give you a foundation to get started, but they are not enough on their own to tell you how to write any Chinese character. In order to get into writing full characters, you need a lot of practice. First a word on the order of the strokes in Chinese characters: it is is important which order you write the strokes in. Children in Chinese schools will all practice the same stroke order for each character, until it becomes natural. If you don’t get the order of the strokes right, the character will actually look different, not like an authentic Chinese character. In my opinion, the best way to understand how to write Chinese characters is through a lot of practice with different characters. Fortunately, there are now a wealth of tools that will show you how to write any Chinese character, step by step. One great website is Arch Chinese, which not only has a Chinese dictionary, but also shows you how to write characters, and has an audio pronunciation guide. At the top of the page there is a setting for simplified or traditional characters (simplified characters are used in Mainland China, and traditional characters are used in Taiwan and Hong Kong), so the website can help you, whichever set of characters you are learning. Go to the dictionary here, and you can look up any character by entering the Pinyin, or by typing in the character itself. When you get the definition, you will also see how to write the character and then hear its pronunciation. Here is an example of the character for ‘you’ (你）. 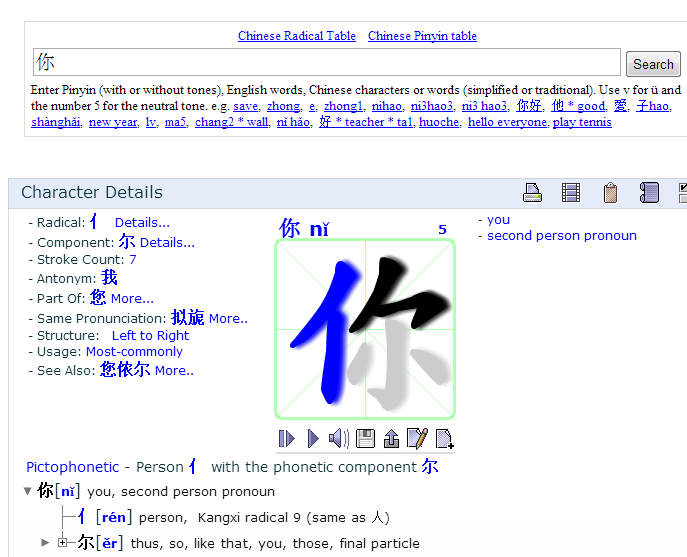 An alternative site is the Yellowbridge dictionary, where you can type in a character using Pinyin, and see how to write it. When the definition comes up, click on the button that says ‘Stokes’. Here is the same example, 你, as presented on this site. By copying these examples as closely as you can, and observing the order and direction of the strokes, you will ‘get used to’ how you write characters in time. This is how I learnt to write Chinese: every time I came across a new character for the first 6 months or so, I used software or a website to show me how to write it, and followed the example. This is the best way to build up good habits in writing Chinese, and to train your self in ‘the correct way’. After some time, I found that all the basic principles made sense, and I was starting to write characters on my own, intuitively. Try it, and you will get the hang of writing Chinese naturally. It just takes a lot of practice; writing Chinese is not something that you will be able to do overnight, and be prepared to forget how to write characters many times! After six years of study, I still forget characters often, as do many native Chinese. Remember that you can always enter the character into your phone to jog your memory! At the beginning, I just concentrated on the characters in my beginner’s textbooks, and the first section of the most common Chinese characters. Don’t try to learn them all at once! If you keep at it, and approach them one at a time, as you study with a course, you will find that there is in fact a logic behind Chinese characters: learning to write Chinese is not an impossible task, it just takes persistence! Good luck!